Although seems a big asset for Albania, a special UN rapporteur visits our country on a 9-day mission to learn about the coexistence of different religions. 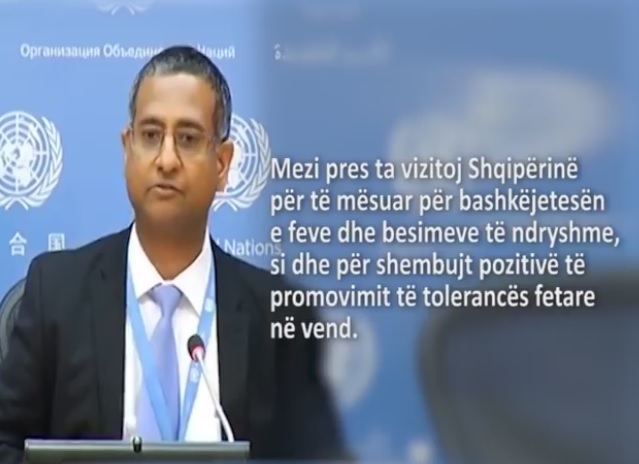 Albania's policies and practises to promote and protect the freedom of religion or belief are expected to receive a note from Ahmed Shaheed on behalf of the Human Rights Council in the first visit of this kind. "I look forward to visiting Albania to learn about the coexistence of different religions, as well as the positive examples of promoting religious tolerance in the country," he said. The independent expert is tasked by the United Nations Human Rights Council for assessing and reporting the situation of freedom of religion or belief in all countries has positively prioritized the situation for which to draw up a report with an invitation from The Albanian Government in a time when that the Mandate of the Special Rapporteur seeks to identify existing and new barriers to the enjoyment of the right of freedom of religion or belief and to present specific recommendations to overcome them. "It will be a timely opportunity for me to review the freedom of religion or belief in gender, women, children and religious minorities or beliefs," Mr. Shaheed explained. The final report will be submitted to the Human Rights Council in March next year. The meetings with government officials, religious leaders, religious organizations, NGOs, civil society representatives and UN agencies in Tirana, Shkodra and Korça are not supposed to bring any unexpected exception to the reality of religious coexistence in Albania, wanted to become an international example, at the same time that some allegations, mostly Christian, about the real number of their believers in the last census in Albania, seem to have no answer yet. These claims are raised from the number of believers resulting from church baptismal baptism, different from the census on the percentage of Christian beliefs.